How to Add Breadcrumbs Navigation in Blogger? Breadcrumbs navigation is an awesome way to help your blog's visitors and let them easily surf pages across your blog. It is a perfect and ideal way to allow the visitor navigate to the older page with ease. Breadcrumbs navigation shows your homepage as well as category page linked to that post so that the visitor can track back to the desired category and check out more contents about that particular category. So today, we are going to explain the easiest way to add breadcrumbs navigation to blogger blog and also we will discuss some of its major advantages too. So let's start rolling your fingers on the tutorial. 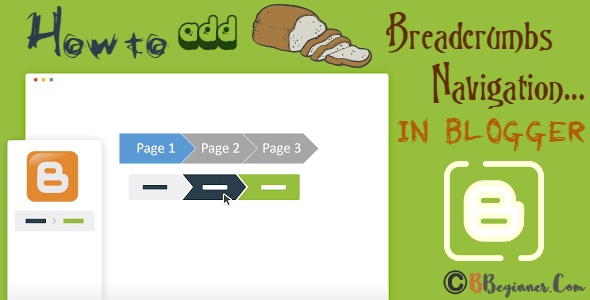 Before heading directly to the tutorial, let's know what actually are breadcrumbs navigation. While adding breadcrumbs navigation to your blogger blog, you must understand its advantages and look how is this going to benefit you. So I am going to list some major reasons point-wise. Easy to track-back: As I mentioned above, breadcrumbs navigation let's track back to related category and to the homepage in a single click. Reduces bounce-rate: No doubt! when you provide a user-friendly interface to your visitor, it will definitely reduce your blog's bounce rate. Tells Location: Yes, breadcrumbs navigation tells the visitors his/her location on your website, leading to overall great usability. How To Add Breadcrumbs Navigation in Blogger Blog? Go to Blogger.com Dashboard >> Theme > Backup your blog before making any changes. Then Search for <div class='blog-posts hfeed'> tag (Use Ctrl+F for quick finding) and just below it paste the following XML coding. Don’t do changes in the coding otherwise, it would not work properly. Once done, Save the Template. Note: You may find two <div class='blog-posts hfeed'> tags, make sure you have to work with the first one. Now, Search for </b:skin> tag and just above it paste the following CSS coding. All done! Congratulations! Breadcrumbs navigation has been successfully added to your blogger blog. You can customize the above CSS as per your desired looks. Moreover, this breadcrumbs navigation won't affect your SEO score so don't hesitate while using it. To change the width of breadcrumbs navigation bar, simply search for width:620px; and change the value to your desired one. If you want to change the font-styling then search for font-family:Verdana, sans-serif; and replace it with your desired font coding. You can also change the background color by changing background: #eee; with the color code of your choice. In the last! I'm glad to see your huge response to my previous articles. Do comment below what you want to see next on BBeginner. Also if you have any query, do let me know. why the hell your css code have your blog name ? Yes! It's just because of copyright issues. If someone copies our codings and share without our permissions then this customized CSS will help. So we write codings in such a way that it will contain our branding. I don't understand your explanation here, the first code block you present here there is no instruction to what to do with it, either to replace the code line you mentioned before or keep it. I hope your blog is the best for getting blogspot tips and tricks. Because here I get important widgets for blogspot. Thanks for your awesome blog and you also can read add breadcrumbs navigation in blogger. Because this is updated! Confused? Feel free to ask! We love comments! We appreciate your queries but to protect from being spammed, all comments will be moderated by our human moderators. Read our full comment policy here. Let's enjoy a happy and meaningful conversation ahead! How to Setup Freenom Domains (.tk, .ml, .cf, .ga, .gq) as Blogger Custom Domain? How to Remove Subscribe to : Posts (Atom) Links? How to Add Custom Ads.Txt File in Blogger? How to Disable Right Click On Blogger Blog? How to Add Specific Featured Image/Thumbnail in Blogger? Copyright © 2017-18 All Rights Reserved by BBeginner.Com ׀ Designed by Hammad Ansari.